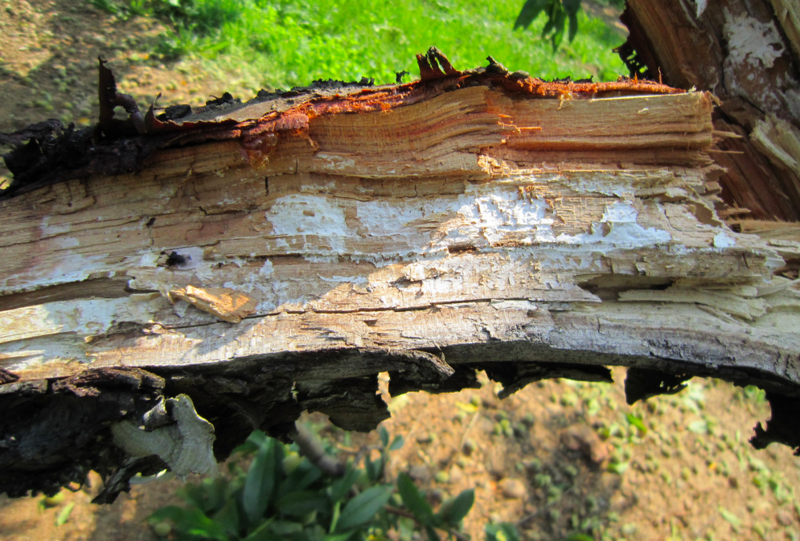 The differences between white, brown, and sapwood rot fungi can be characterized by how they decompose trees, the symptoms that may be present as a result of the infection, and the severity of damage. Brown rot fungi: decays the carbohydrates in the cell wall of tree cells leaving an abundance of lignin behind. 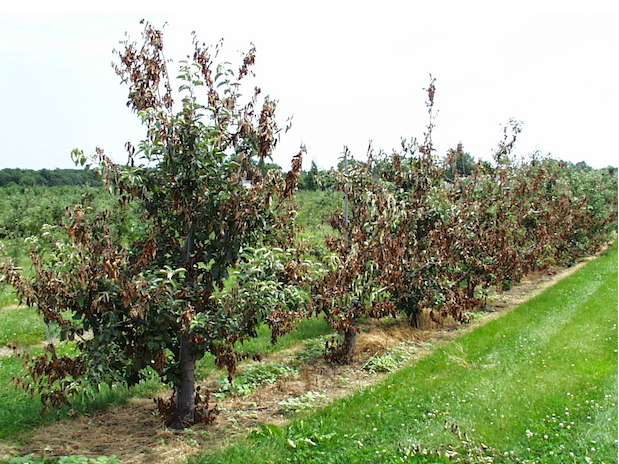 Effects of brown rot occur rapidly and can often times be seen with the naked eye. 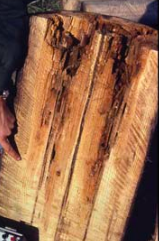 Because the onset of brown rot infection quickly weakens the structural integrity of woody material, damage can often times be categorized as severe (1) and by many arborists, is considered the most severe form of decay because of its rapid onset that usually affects more of a tree than is immediately noticeable (4). The affects of the fungi that are not immediately noticeable are due to the removal of cellulose from the tree’s tissue. This removal of cellulose reduces the tree’s ability to bend without structural failure occurring. Figure 2 below shows a telephone pole that is infected with brown rot fungi. Although brown rot fungi does not usually kill a tree, it is considered a severe infection because of its ability to destroy the structural integrity of trees. As a trees structural integrity decreases, its risk (considering human safety and damage to cars or buildings) increases. Brown rot fungi can also spread from an infected tree to a non-infected tree when wind or rain water carries the spores to a suitable host (12). Some of the management strategies to reduce the impact of brown rot fungi include pruning four to six inches below sunken or dead tissue on a branch; burning the infected branches (if legal), and cleaning pruning supplies in between each tree or after pruning a site known to be infected with 70% rubbing alcohol solution. If the sapwood of a tree is known to be infected with brown rot fungi, then an advanced assessment of the tree should be completed or the tree should be removed because this would greatly increase the risk of the tree. Oak wilt: caused by the fungus Ceratocystis fagacearum is a severely damaging and deadly disease of many oak species (3). Oak wilt is transmitted by picnic beetles (nitidulid beetle) which are attracted to the wounds of oaks (may also be transmitted from root grafts of infected oaks to new hosts) (8). Many oaks are annually wounded by storm damage, lawn mowers, and pruning. It is these regular damages that are suspected of predisposing a tree to oak wilt. All Oak species show signs of oak wilt by browning of the leaf tips and flag poling. The browning of leaves due to this infection progresses inward. Flag poling is a symptom of the disease that occurs when a whole section of the tree its off individually. A picture representing flag poling is represented below, on the left. 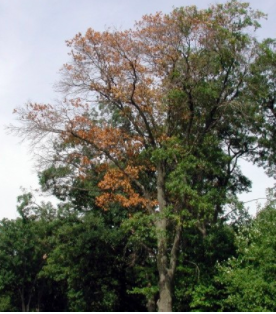 If a tree is suspected of oak wilt, a local plant disease expert should be called immediately. If the tree is confirmed to have oak wilt disease, the tree needs to be removed in order to prevent the infection from spreading. There is no known cure for oak wilt disease (8). Oak wilt infestation is categorized as severely damaging because it usually results in the death of the infected tree (3). Microorganisms causing decay in trees and wood. Blanchette, R. 2006, Research Projects/University of Minnesota. Fire blight on ‘Chenango Strawberry’ apple trees. David Rosenberger. 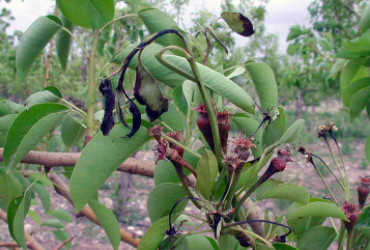 Tree Fruit Diseases: Observations and Archives. blogs.cornell.edu/plantpath. May 28, 2014. Fire Blight. Extension Utah State University; University Idaho Extension; Colorado State University Extension. Utah State University copyright. intermountainfruit.org. Intermountain Tree Fruit Production Guide. Oak Wilt: A Threat to Red Oaks and White Oaks species. The Tree Doctor (aka The Plant Doctor). Michigan State University. treedoctor.msu.edu/oakwilt. Oak wilt: Diagnosing and preventing. Bob Bricault. Michigan State University Extension. msue.anr.msu.edu/news/oak_wilt-diagnosing_and_preventing. July 28th, 2014. Wood Rots in Apple Trees. Alan R. Briggs- West Virginia University. Cooperative extension. articles.extension.org. 2018.